The Enslow Covered Bridge is located in Perry County, Pennsylvania. I grew up in Perry County and I'm familiar with 4-5 of the covered bridges located there. When I was a child, my brother and I would "lift our feet up" every time we crossed a bridge in our family's car. It was sort of a game that we all played, excluding the driver. If one of us would forget to lift our feet up during the bridge crossing, the other one had to take the trash out for a week. Oh...those silly games we played as children. To find the Enslow Covered Bridge (The Turkey Tail Bridge) you'll have to travel up to Blain, Pennsylvania. The bridge is located on Township Route 312, Adams Grove Road and is approximately 1 mile southeast of the small town called Blain. The bridge is done in your traditional color of dark red with white trim. It was built in 1904 and is a Burr-arch truss bridge, open daily to traffic...but mainly used by the locals. The bridge is approximately 110 feet long by 16 feet wide with a clearance of 11 feet and 0 inches. It is owned and maintained by Perry County and the structure crosses the Sherman's Creek. 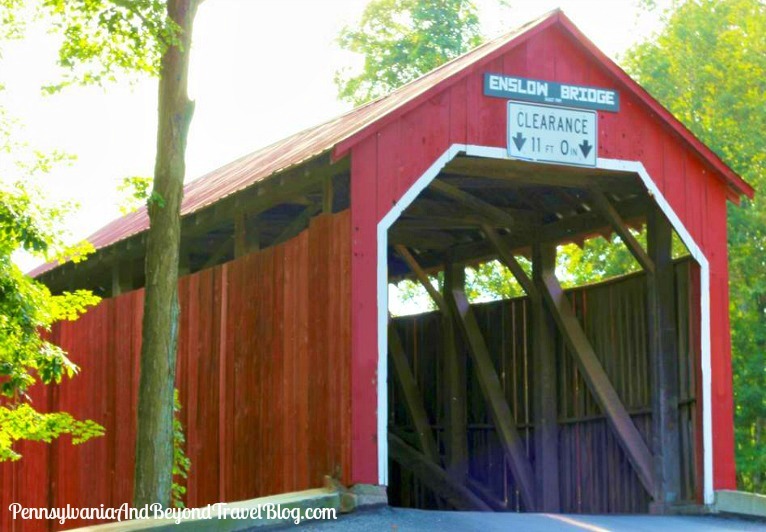 If you love traveling through small towns and the countryside, a road trip to see the Enslow Covered Bridge would make for a great afternoon outing, especially during the fall season when the Fall Foliage is at its peak. Note: You can double-click on the photo to have it open up in a new browsing window and in an enlarged size, so that you can view the details up close. Thank you for keeping our travel blog mobile reader-friendly.